Google today announced a noteworthy addition to the relevance algorithm that dictates what ads you see throughout its AdSense network. Known as Interest Based Advertising, essentially what it does is add behavioral targeting to a formula previously ruled by contextual targeting. Its AdSense network (network of websites that agree to host “Ads by Google”), in other words has erstwhile shown ads that relate to content on the page. This will still continue to happen, but ads will also be shown that relate to a given users proven interest in different topics. 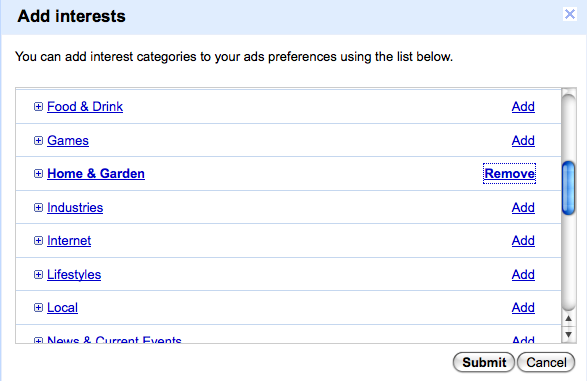 This “proven interest” will primarily be dictated by the previous sites users have visited. When a user goes to a given site in the AdSense network (a vast majority of commercial sites), Google will assign a cookie to his or her web browser. It will then use this info to place the user within any of the 600 categories it has set aside for this purpose — a designation that is used to determine the ads shown when the same user visits other sites in the AdSense network. Partly anticipating privacy concerns and partly to increase relevance even further, Google has also added a dimension that lets users actively choose what kinds of ads they want to see. Think of this as a “manual override” to the automated targeting described above, which lets users go in and check or uncheck the boxes that define their interests. All together, this is a natural evolution of AdSense that adds an additional degree of relevance to the ads it’s serving. Most moves that Google makes come back to this idea of better relevance. This is also analogous to what it’s already done with personalized search — refining search results based on a user’s history when they are logged into Google (tied to Gmail account). This can be seen as a consumer-centric play, but it also increases Google revenues. Better relevance, in other words, generally increases click through rates and thus Google’s performance for its advertisers, publisher partners (AdSense) and its own pay per click revenue. For AdSense, this revenue is split with publishers 80/20 in publishers’ favor. An interesting side note here is mobile: Included in Google’s many moves into the mobile world is the AdSense for Mobile program. As the mobile web becomes more and more like the online web (given devices with full web browsers), mobile search will increasingly mimic the user behavior and dynamics of online search. The point, as it relates to today’s news, is that behavioral targeting on the mobile device will be that much more relevant: There is one user per device as opposed to desktop computers that are often shared amongst families. There will also be an additional dimension of targeting that is perhaps more powerful than contextual and behavioral: Location. Add them all together and you can see where Google could be headed.